What a wonderful Sunday we had at the Peterborough East of England Wedding Show hosted by the wonderful Events Company Cupids - it was huge success, lots of choice for everyone who attended, with lots of our favourite preferred suppliers too (The Country Garden Florist, Eden Florist, Fabulously Flora Cakes, Lucy Anne MUA, The Chapel Hill Duo, The Haycock Hotel). Its so nice at wedding fairs to meet potential new clients, i have to say we had a record number bookings from yesterday and an own Personal Best...one bride booked us within an hour of the doors opening, Our new beautiful bride Sam and her mum looked at our stand and fell in love with our romantic light and airy images, and also our whole ethos when it comes down to how we are with our brides - I even made Sam's mum cry with excitement of the thought of having us photograph her daughters wedding!! I am so proud that we managed to get this kind of emotion from someone with our work - I have a very warm 'Ready Brek Porridge" glow around me today remembering and feeling so very proud (you had to be an 80/90's child to remember the ad).. Yey go us (high fives - gosh i wish i knew how to get emojis on here ha ha!! The show really did go well and we had such a great response my phone has been red hot with booking appointments last night and today. My little chocolate bear - you can see all he is thinking is - "just feed me mum - stop taking pictures of me...FEED ME!!!" Don't forget we are at the Haycock Showcase Evening this Thursday 22nd from 5.30-7pm. 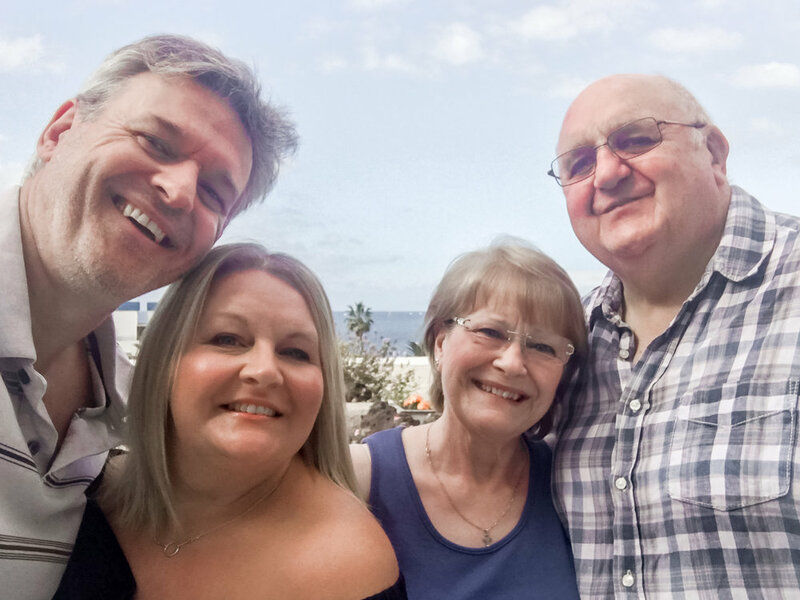 Us with Mummy & Daddy Ess, on our balcony on our last day, getting everyone together for our obligatory family selfie - my mum the nest building mother hen and my daddy my superhero! January went in a Blink ! HOLIDAY WHOOP WHOOP!!! 18 nights away in the sun, so missed all that snow and those really bad winds... we were laying by the pool enjoying the best weather we have ever had in January in Tenerife. We love to get our winter sun, its our time to recharge our batteries with the gorgeous sun's vitamin D rays. We stay with my mum and dad (who are already out there with their friends its like the OAP AGM in tenerife in January ha ha ha we love it!) its such a nice way to spend quality time with them my parents and their friends, We go out for nice meals, drink nice wine and eating lots of lovely food with all of 'olds', but we also like to go out our own - it's our "date night" which we just walk out hand in hand in the evening sun and just 'be' with each other, watching the sun goes down, reflecting on the last year and feeling proud of our accomplishments and make plans for 2018. We talk about our hopes and dreams and our 6 year plan and dream about where the next chapters will take us to - its my most favourite time being with my most favourite human in the world, in the sun laughing and boy do we laugh, drinking red wine and talking about our future. The sun going down on in Tenerife 2017...time for home! 1. De-clutter everywhere in the house - I am the queen of buying - doesn't matter what it is usually clothes, shoes and handbags oh and make up and smellies - so now my plan is to go through everything and throw out lots of stuff i don't want - this will be an ongoing thing until we are minimalistic ha ha well minimal of sorts....less clutter. 2. "DRY" February! - this does not been off the booze, its means months where I do not buy anything for myself, instead i give items away, either to friends and family or to our local Cancer Charity Shop. This is a hard one as i love shopping and spending as mentioned in fig.1, I am the Queen of shopping, but i am determined to not spend so much this year, to try and be more money savvy but also to give more to charity, especially Cancer research and RSPCA , This is so important to me. 3. Make every evening meal with my husband special, light the candles, have napkins on the table and have a nice glass of Red Wine - and just breathe in the love for being with another - so basically every meal is a Valentines meal but not gushy just appreciating each other. Just making it special like this just creates a really lovely atmosphere and is very civilised don't you know ha ha ha We also have a new tradition that in the evenings as well, we will have a filtered coffee and a couple of Ferrero Rochers...I love creating new traditions. And anything that allows me to eat more chocolate the better. 4. Don't sweat the smalls and Count my blessings, I am going to do this everyday, I am going to try and remember every day how lucky i am not only that i am my own boss, working for myself and working from home with my amazing husband and dog. But personally too having a wonderful husband and friends and family. When i think about how lucky i am and counting my blessings in life just makes me feels better. So when someone stresses me out, or when some is being annoying i just don't sweat the small anymore, i just let it go and count my blessing! It really does work and appreciate my life. 5. Try and buy only but Organic food and only buy Cruelty Free product from Make up to cleaning products to shopping bags - no more buying plastic bags!! (we need to protect our oceans you know). I love animals but no i am not a vegetarian but I would love to be one but i do love the taste of meat, so I have decided I am cutting my meat consumption down, and what i eat has to come from friendly farms, grass fed animals. I have also recently discovered that i have a Lactose intolerance, I have actually had it since birth but my mum forgot to mention it ha ha ha go figure all these years so many tummy issues and now she tells me ha ha ha so now i know i am going to be more aware or Lactose in my diet, aware of what i am eating and try to look after my stomachs well being, it is really important to look after you digestive system. 6. Practising the art of "Hugge" pronounced "hoo-ga" - Its a Danish way of living, in short its all about living in a cosy, warm way, its all about well being, happiness using lots of candles, meditation, healthy living and lots of fresh air and clear minds. My mum told me on holiday that my ancestors are form Holland so i feel practising this Scandinavian way will suit me down to a T! 8. Start a BLOG - I have been wanting to add a blog for ages but could never find the words and felt silly writing stuff down - but something inside had clicked and here i go... hope you like my ramblings ha ha ha. SO THIS IS my 2018 list, Key Points are Remembering gratitude and love for my nearest and dearest and a clean and less cluttered environment should lead to a decluttered mind and looking after myself physically and mentally... Have you made a list? How is it going for you?